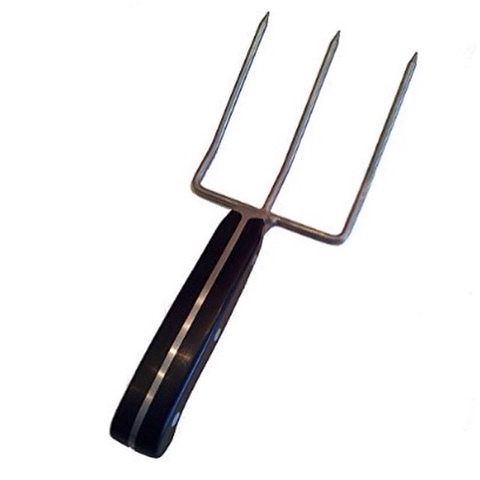 This is a nice fork for use with BBQ, pulled pork, roasted turkey/chicken or on Thanksgiving. Anytime you might really need a large apparatus to hold onto some meat for leverage and tear into it. This is a very large fork, about 1 1/2 times the size of my hand, so it can really take hold of some meat and you need to carve it or you want to actually rip apart the meat with the fork, such as what you would with pulled pork. It has three tines on it so it gets into the meat and holds onto it well. I think it's best at work when it is helping to carve meat, as it is holding the large Turkey together with one hand and re other is carving the meat.